You always thought you could do better, right? Sign players better. Play differently. Take these three points. Now you have the opportunity to make your football dreams come true … Forward! Sign the contract and take the reins of the club. Get tasks from management and start working with players. Whose time in the club is over, and who is ready to debut in the first team? Your breeders know who is able to strengthen the composition and whether you can afford it. Start training, roll up your sleeves. To realize your vision, you need to work. Coaching staff will help if you allow them. Some coaches do everything alone … In the press, your tactics are called ambitious – they are probably right. Yes, it would be quite possible to play 4-2-3-1, but after all, everyone plays like this … And now the stadium is packed, the fans are impatient. It is the day of the game. Leave the chosen tactics or will you make changes right from the edge of the field? Your choice, your path. You are the only creator of the fate of your team. And your path is unique. Players can get fame, but their fame is your story. This is Football Manager 2019! With FM19, football is getting even closer. Thanks to the new gaming capabilities and the refined mechanics of the game, you open up new realistic ways to manage your team. New workouts thoroughly recreate the training process of professional football teams. Specially selected tasks and training schedule allow you to fully control the preparation for the next game and the development of future stars. Or you can just reap the benefits by delegating hard work to the coaching staff. Discover new horizons and create a unique football philosophy with the help of new styles that reflect the most current tactical trends in modern football. You can also take advantage of new ready-to-use development patterns and try to achieve success with their help. Convenient and understandable paths of development – a new feature designed to help novice managers discover their potential. Initiation into managers takes place under the guidance of an assistant, covers the basics of football management and helps you pave the course to the heights of excellence. For the first time in the game, you can try your luck in the fully licensed Bundesliga and Second Bundesliga – official forms and emblems are waiting for you, as well as players similar to their real prototypes. 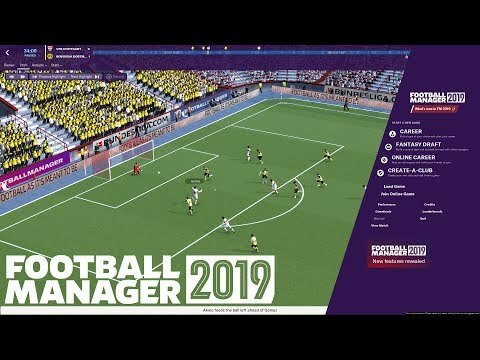 Thanks to the new modern design Football Manager 2019 has a fresh and current appearance – the new game looks great and it is very easy to start playing. The list of innovations also includes match enhancements, the introduction of a VAR system and an automatic goal determination system, agent summaries during the transfer period, an improved view of the manager’s work environment, more detailed pre-match summaries, interface improvements, new Steam achievements and much more.